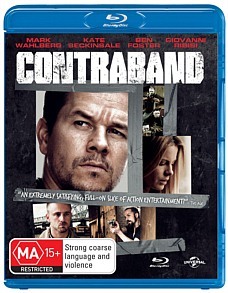 Contraband Review. Although some of the early shots were interesting, I found this increasingly tedious. Chris (Mark Wahlberg) is an ex-criminal who has gone straight. He works for a security company and lives happily with his wife Kate (Kate Beckinsale) and their two young sons. When her kid brother Andy (Caleb Landry Jones) is trapped in a smuggling operation and forced to throw the product off the side of a ship he must answer to a psychotic criminal, Tim Briggs (Giovanni Ribisi). Andy owes this thug a lot of money that he doesn't have and has to turn to Chris for help. Chris learns that if he doesn't get the money Tim is going to come after him and his own family too until the debt is paid. It's time for one last job as Chris is taken back into the fold and chooses to smuggle $10,000,000 in counterfeit bills from Panama. He has a job on a cargo ship, driven by Captain Camp (J.K. Simmons), to help him into the area and transfer the goods. Meanwhile, Chris' best friend Sebastian (Ben Foster), a recovering alcoholic, is helping to look after Kate and the boys back home. A man's gotta do what a man's gotta do. Yes, even when it's this dull. 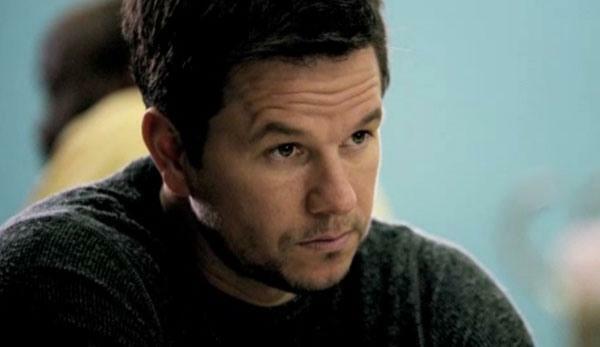 That's the task for Mark Wahlberg, who is a producer on this very disappointing action-thriller. I can in many ways see why Wahlberg was attracted to the project. He has led an extremely colourful life that reads like something straight out of a Hollywood movie. In his early years Wahlberg had a real life history with crime, including assault and attempted murder. He, his brothers and his sister have all spent time in gaol but now he is a born again Christian and on top of acting he has also spent time modelling and making rap music. Don't you remember Marky Mark and The Funky Bunch? His life is a lot like the characters he plays in his movies: hardened men who are troubled but also find themselves unjustly on the wrong side of life. Yet this is an extremely tedious vehicle for Wahlberg, from established director Baltasar Kormakur, who has made his first Hollywood feature. What's really tiring about this movie is the way the characters are at all surprised by the turning points in the plot. It still comes as a shock here that one last job is on the cards. Any movie character who is an ex-con should throw away their phone and head to Siberia because there's a shortage of new criminals being blooded in Movie Land. The conventions of the plot aside, there are stylistic problems with this film too. In order to be what we will call "raw", "gritty" or "down with it", this movie employs some old favourites like shaky cam and film grain to nauseating affect. Every second shot in this film is photographed with an ultra tight close up, just in case you have both the attention span and the eyesight of a goldfish. It looks ugly and its incredibly dreary, unless you're excited by the vision of environments like cargo ships and loading docks, in which case you probably can't see very well anyway. This is a shame because some of the early shots of the night sky, lit up only by faint lights across the city, gives the film some texture, like a neo-noir look. It makes the film seem more promising than it actually is. It's all about attitude but it becomes about as infectious as a kid carrying a boom box, who wants to talk jive with you. The film becomes exceedingly dull when so much time is spent (wasted) on the cargo ship. Now I'm not one who gets his jollies from seeing headshot after headshot or forks jammed into unsavoury places but I was willing to let this slide as a straight up action movie and renew my membership with the 'boys own club' for an evening (strictly one evening). What surprised me is that there are very few set pieces in this film. There's one big shootout that comes late in the film and some very alarming scenes involving a home invasion. Most of these are dismally over-edited and shot in ways that defy human vision. I would go so far as to say that they're cut up by someone who has no idea what they're doing. When the below average Joe pays up for an action thriller involving Mark Wahlberg, they expect some fire fights, but at one point he is vacuuming instead. This is most likely because the film was made on an ultra low budget of just $25 million, which is lunch money in Hollywood. Housekeeping is about the only the surprise in Wahlberg's one-note performance because it could have been played by anyone with a dark jacket and brood to match, including myself. There are some unusual little details to the other characters though. Tim, who sounds like he has a terrible cold, makes the point that he has bills to pay and we see that he has a daughter. I don't think he'd ever make a successful applicant for child welfare but it would be too much for the film to ever make a point of it. In fact, he's manhandled so early on that you wonder why Marky Mark didn't just stay around. Ben Foster and Kate Beckinsale don't feature anywhere enough until the final quarter, the latter must have all her latex suits out in the wash somewhere. I found some of the domestic violence scenes with her quite unpleasant too. The strangest piece of casting is J.K. Simmons. Why on Earth would you bother casting someone of such comedy gold if you're not going to give him any funny lines to work with? Although some of the early shots were interesting, I found this increasingly tedious. Along with this and the disappointment of The Grey, it might be time for the 'man of honour' to ride on home. Unless someone calls Clint again.